Farnham Common Tennis Club has six young players training with Bucks county 8or9/u squads. Stephen is the Director of International Tennis Coaching Ltd. He was ranked no. 10 in Queensland, Australia. He has also represented Bedfordshire's County Team in the Summer and Winter County Cups. Stephen was part of Stirling University's International Sports Scholarship Programme. 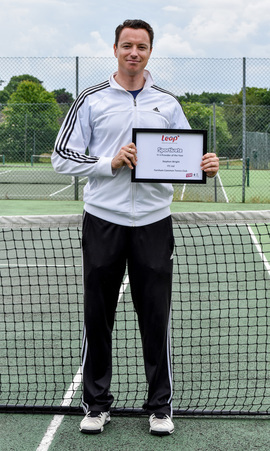 Stephen won the 'Deliverer of the Year Award' through LEAP in 2016 which recognised his contribution to increasing participation rates in tennis in Buckinghamshire. Stephen was also a nominee for Coach of the Year in 2017 for his outstanding contribution to tennis in the County. ​Stephen has won the Meme Griffiths Award for 2018. The Meme Griffiths Award is presented annually to a Bucks volunteer who has given exceptional service to tennis in Buckinghamshire. The award was presented to Stephen at the Bucks Tennis AGM on 26th November 2018 by President Rosemary Badman, past FCTC member. Stephen has made an outstanding contribution to,tennis life in the County in many areas, and in particular in developing juniors' team play. Stephen has appointed coaches Kate Turton and Lee Nixon to the team. Kate is an LTA qualified and licensed level 5 coach and Lee is level 3. They will help out with the coaching at Farnham Common when the need arises. Kate has over 30 years coaching experience after representing Great Britain as a junior. She has also represented Bucks County for many years. Kate has worked at many clubs and has spent the last 20 + years as the Head Professional at Wycombe Abbey School. Kate enjoys teaching all ages and all standards and is an ongoing student of the game. Lee is an LTA Level 3 Tennis Coach. Having played tennis from an early age, he played County Tennis in many local tournaments whilst growing up in County Durham and played for the his university's men's A teams in both singles and doubles. More recently he represented his home club (David Lloyd Teesside) at local and regional Level and also captained the Men's A Team. During his time coaching Lee has developed people of all standards and levels from juniors to adults. The standards vary from beginner/intermediate, junior county and 4:1 LTA ranked players. Having 26 years of experience in the sport, Lee is able to adapt to any type of player to help improve their game. As a tennis coach, he likes to focus on doing the basics correctly as these are the building blocks to your strokes and game, whilst making sure every session is fun and enjoyable! Stephen's Summer term 2019 junior coaching schedules can be viewed and downloaded here. Coaching is weekly (or more frequently for Aspirates players) and helps younger members aged 4 - 18 to enjoy their tennis in the cooler months. Those younger juniors who sign up to the Apirates programme get the opportunity for more intensive training (two or three times a week). ​Stephen has expanded his coaching so that either he or a member of his team is available at the club on any day of the week. Our adult classes cater for complete beginners as well as more advanced players. Currently we run a class for adult intermediate players on Tuesdays 7:30 to 8:30 (included with the junior schedule). Our Adult Intermediate Class will be continuing at Farnham Common Tennis Club into 2019. As the class is a intermediate class we cater for players that have a little bit of experience of playing tennis. If you use to play tennis many years ago and would like to get back into it, this is also the right class for you. The class takes place in a very relaxed environment with a great coach. You don't even need your own racquet as we have racquets you can borrow! The details of the sessions are below. Cost: £51 members, £66 non-members​ for six weeks.. Here is a Vimeo testimony for a recently-joined member who recent attended this course. We will again be offering a wide range of camps in 2019, as in 2018, as we have combined the resources of three local clubs, with very encouraging results. The Easter Camp is about to start - details are here. ​ There will becamps in the summer and autumn, both at Farnham Common and Chalfont St Peter, at all school half-terms and holiday, typically lasting three to five days from 10am - 4pm with a half day option. The summer 2019 half term camp runs between 27th - 31st May. Full details to come, but please put these dates in your diaries. Another three Farnham Common Tennis Club members have been selected to attend County training camps at the High Performance Centre in Halton: Joseph Lally, Mylah Anderson and Astrid Anderson..
Last year's County trainee players, Finley Kidd, Samuel Mooney and Amy Carson, have now been selected to attend for a second year. Match stating (discover your ‘actual’ strengths and weaknesses in a match situation). Group lessons can be booked for between 30 minutes and two hours depending on players' requirements. To discuss specific details call Stephen directly on the number below. His current adult lesson rate is: £40 per 45 minutes, £25 each if two players, £20 each if three players and £18 each if four players. Rates for juniors (ages 18 years or under) are: £30 if one junior for 45 minutes, £19 each for two juniors, £15 each if three juniors and £12 each if four juniors. Please note for non club members that there is a £2.50 charge per lesson per person on top of all the rates mentioned. This charge will go to the club and will be collected by Stephen.